When I was young I wanted to see the Loch Ness monster so bad. It was both exciting and terrifying beyond belief. The thought that there could be anything remotely dinosaur-esque hidden somewhere in the world captured my imagination. But I've also always been terrified of what might lurk under murky water. So Nessie always held a special allure to me. If I could have seen the Loch Ness monster in person, I could have died a happy ten year old. But I would have also pooped my pants. I've since given up hope but the grainy pictures still send a modest shiver down my spine. In a good way. 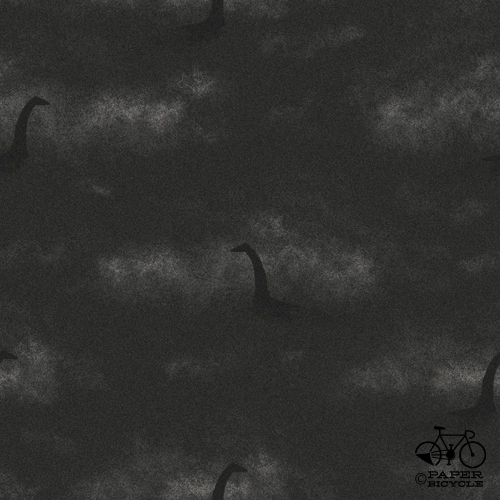 This pattern started out as a pack of happy sea monsters but I quickly realized that it should be dark, grainy, foggy and unclear. It's just more exciting that way.